Do you know how much a solar system will cost you? Have you considered the various financing options like solar panel leasing, power purchase agreements (PPA), or personal loans? At West Coast Solar, we don’t want finances to stand in the way of you saving money on your utility bills and reducing home carbon-emissions. 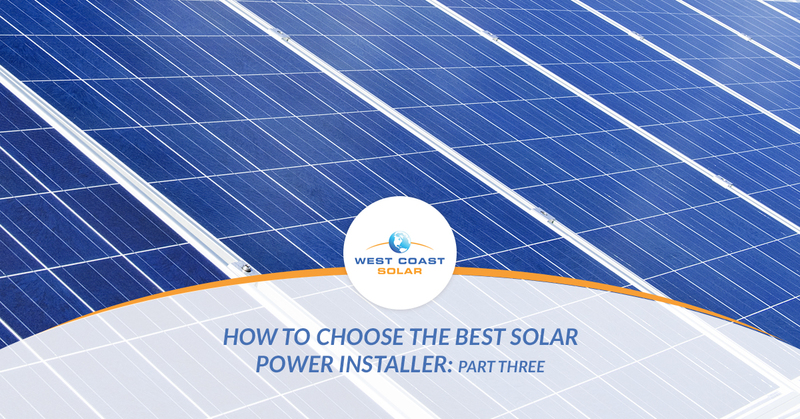 In this blog series, we’re sharing 38 questions you can ask potential solar power installers before you hire them. In this post, you’ll discover 14 questions about financing, liability, insurance, performance, and more. Are you ready to make the switch to solar power? Give West Coast Solar a call today! We serve San Jose, Sacramento, and the surrounding areas with superb customer service, excellent installation expertise, and top-notch solar components. Otherwise, continue reading to learn more! When it comes to financing, you’re going to want to know exactly what a solar power system costs, how you will be paying for it, and what is expected of you through various financial options. Which types of financing do you offer? What’s different about your financing than your competitors? What happens if I fail to make solar payments? Can a lien be put on my home if I fail to make payments? What’re you responsible for when it comes to repairing, replacing, or re-installing solar power components? Ask potential solar power installers the questions below to get a better idea of what you will need to do to cover your system with insurance. Does your solar power system come with an insurance policy or do I need to take out an additional homeowner’s insurance policy? What’s the cost of insuring my solar system through you? What does your policy actually cover? Can I get a copy of your policy to compare rates? There is only so much a solar power company can estimate on performance and savings. However, most solar companies have been installing systems and serving their customers for years to have a pretty accurate range for a given area when it comes to savings and performance. Make sure you ask potential solar power companies some of the following questions to learn more. What’s the fee for breaking any kind of PPA, lease, or other contract early? What happens if the solar system produces more energy than expected? Do I pay more? What is the minimum performance guarantee of the solar system? How will I be compensated if the system does not perform as expected? We know it can be tough to find the best solar power installer for your project. Although the internet and communications have made it easier to find companies in your area, it still takes time to call and research said companies before hiring them. That’s why we created this four part blog series — to share 38 questions to ask potential solar companies and review the four biggest areas of focus when choosing which company to hire. Want to learn more? Read part four of this series. Otherwise, give us a call today to get started on your solar power system!